زودرنج, صدیقه, کوچکی نیت, زهرا. (1396). شور حسینی در شعر بیداری اسلامی بحرین. مطالعات بیداری اسلامی, 6(11), 64-76. صدیقه زودرنج; زهرا کوچکی نیت. "شور حسینی در شعر بیداری اسلامی بحرین". مطالعات بیداری اسلامی, 6, 11, 1396, 64-76. زودرنج, صدیقه, کوچکی نیت, زهرا. (1396). 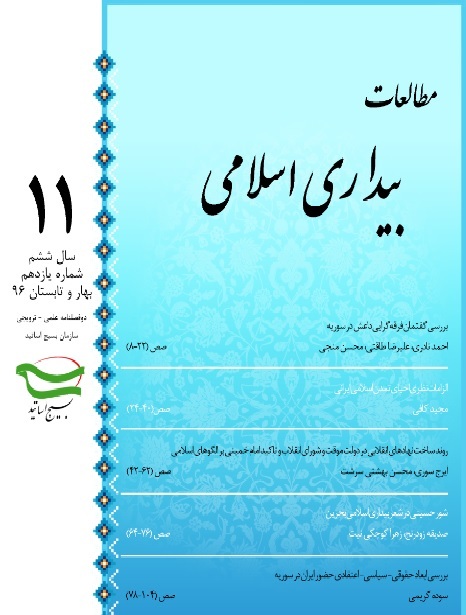 'شور حسینی در شعر بیداری اسلامی بحرین', مطالعات بیداری اسلامی, 6(11), pp. 64-76. زودرنج, صدیقه, کوچکی نیت, زهرا. شور حسینی در شعر بیداری اسلامی بحرین. مطالعات بیداری اسلامی, 1396; 6(11): 64-76. Islamic acknowledgment and movement in Bahrain is influenced by the Islamic teachings of Ashura as compared with the other movements within all Arabic countries. Because such people have affected by Imam Hussein’s revolution against injustices and their hidden consciousness got aroused. This could govern truth and control the society. At last, it became unique sample in point of the freedom movements all over the world, especially among Shias. Revolutionary and Shia poets in Bahrain are drawn their deep and revolutionary goals in concerning to Bahrainian revolution against the cruelties of governs. There are concepts as anti-oppression, objection-fighting lonely,consisting on struggle against oppression and colonizing, pay attention to Islamic and Shied thoughts as well as contents of Quran and of traditions, rising and acknowledgment, inventing to Islamic uniformity and collocation and reject of split (result of being the whole people), patriotism, the Red Death with leadership, be patient in absentia of Imam Mahdi, resistance and acknowledgment and humanity and Islamic munificence taken by Ashura message. Here, we can expose how to emerge the Hussein concepts in Islamic acknowledged poems as an investigative method. Therefore, we will try to answer questions by analytic- descriptive method. The most changeable concepts in concerning to Imam Hussein (peace be upon him) within the Islamic – acknowledged poems.